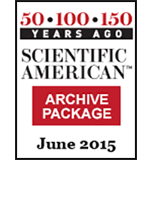 Each month our Senior Editors carefully select the most fascinating, surprising and entertaining illuminations on science and history from our Scientific American archive. Get this package for just $9.99 (each issue sold separately is $7.99). That’s a 59% Savings! Click Add to Cart above to Order Now!